Barbara Healy has a stunning property in Dartmouth, Massachusetts. But nearly two dozen trees that mark her hideaway on White Oak Run have been spray painted with blue circles the size of softballs. "They said that this was part of their program that they have to reduce outages," Healy said. They is NStar - now known as Eversource. Healy said the power company sent a letter asking permission to remove her trees and she said yes. But that was more than two years ago. "We had people out here for days - people surveying and then people doing the dots and the ribbons and then nothing happened," she said. She points into her front woods, "It won't take much to take this tree down." Healy lost power for a week after both hurricanes Bob and Gloria and for three days after Sandy. "We lose our fridge, we lose our water. It's a major inconvenience," she lamented. And it's not just Healy's trees. We spoke to other neighbors with the same complaint and found dozens of spray painted trees for more than a mile. Healy said over the last two years, she's called and emailed Eversource a half dozen times. She characterized last month's response from a customer service representative as pretty typical. "Oh, she couldn't believe it," Healy said. "She said, 'It couldn't be two years -we'll get back to you right away. Someone will get back to you by Monday.' It never happened." We asked Eversource spokesman Mike Durand if he thought two-plus years was a reasonable response time. "Two years can be a reasonable time," he said. "In some cases it can be less and in other cases more." Though he initially said two years was reasonable, Eversource's arborist later clarified that most jobs take six months or less and they hope not to hit the one year mark. Durand insists Healy's trees were not an "immediate" threat, so they prioritized removals in neighboring Westport first. "I can understand that there would be questions," he said. "We have spoken with Ms. Healy and made sure that she was aware to the extent we could on the timing of our project." But Healy said no one gave her any answers at Eversource until she started peppering the company with calls after she got in touch with necn. She claims she has been given conflicting reasons for the delay. First she was told that Eversource didn't have the resources to take the trees out two years ago - then that the town was holding up the removal because White Oak Run is a scenic road. But we talked to Dartmouth's tree warden and he said it's not a scenic road and Eversource hasn't asked for any clearance for jobs on White Oak Run. About the responses to Healy, Durand said, "That's not the way the process should work. That's not the way we want to communicate with our customers so we will definitely look into that." Healy hopes so and hopes that her trees won't be left to fall. "In a fancy neighborhood it wouldn't have been left for two years, but we're out in the woods so we're not high priority, I guess," she said. 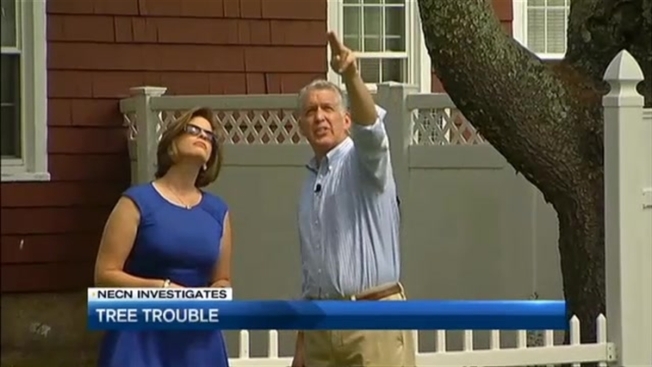 After our interview, the Eversource arborist went to check Healy's trees again. The company told us and her that they hope to begin removing them in the next two months.